Colton Albury had a very impressive game in the last round for Pros, receiving a Interperformances Player of the Week award for round 10. The player had a double-double of 53 points and 12 rebounds, while his team Pros moved-up to the 9th position in Bahamas NPBA. Too late to salvage the team, which is currently ranked at the very bottom. They already lost 9 games and recorded just one victory. In the team's last game Albury had a remarkable 64.7% from 2-point range and got seven three-pointers out of 16 attempts. He has many years of experience at Pros, through which he has constantly improved. Colton Albury has solid league stats. He is league's best scorer averaging so far 22.3ppg. Albury is in league's top in rebounds (5th best: 10.4rpg) and averages impressive 54.3% FGP. The second best player in last round's games was William Rigby of Shockers. Rigby had a very good evening with 22 points, 7 rebounds and 5 assists. 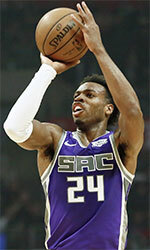 Of course Shockers cruised to a 120-110 relatively comfortable win over the lower-ranked Pros (#9, 1-9). Shockers' 5th position in the standings has not changed. His team is not often considered as one of the league's best with a mere 4-5 record. Rigby is one of the most experienced players at Shockers and has a reputation of one of team's most reliable players. Third on the list of top players last round was another Shockers' star - Adam Johnson. Johnson scored 21 points and grabbed eleven rebounds (!!!). He was another key player of Shockers, helping his team with a 120-110 win against the lower-ranked Pros (#9, 1-9). The chances of Shockers ranking at the top of the league, however are very questionable as they have already lost 5 games, recording just four victories. With bigger assistance of his teammates, Johnson could help Shockers to bring them higher in the standings. 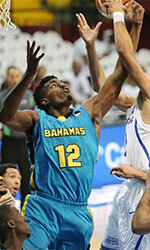 Johnson has a great season in Bahamas. After only 5 games, he made it on the list of the league's leaders in rebounds with 9.4rpg (8th best).